In this year, there are more and more people who want to get married. During this month alone, the number of the newly wed couples are so many. With the many days of holiday, it’s good to spend their honeymoon in a different place other than their usual spots that they used every single day. 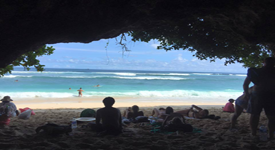 One of the choice is things to do near Uluwatu Temple in Bali island. Even though there are some other more famous places in Bali like what to do in Uluwatu, Uluwatu always serves the tourists with so many things related to art and culture. Beside those, Uluwatu also has some romantic things to do in Uluwatu at night which can entertain all the tourists who come there. Here’s some of the best places in Uluwatu. Of course, as a starter, we can go to the Uluwatu Temple first. 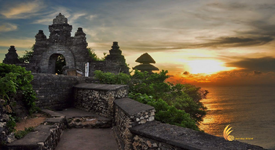 This temple with the complete name of Luhur Uluwatu is not only having the beautiful form of architecture, but also, the tourists can enjoy some things that maybe cannot be found in other temples. 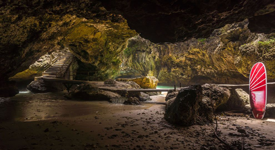 Beside the things to do in Lake Batur Bali, if you want to explore attractions that look quite normal during the day, but maybe different during the night, maybe this place called Suluban cave is suitable for you. Located near Green Bowl Beach, that usually used by the tourists for doing some water sports. If you want to visit this beach, it’s better to visit it not during the night, but rather in the evening. Why? Because in the night there’s no single light that can help you. It will be very dangerous in there during the night, especially because of those corals that you can step on. So, if you want to visit this Green Bowl Beach, better to visit it in the evening, so you can watch the view of the sunset in the proces. Also the entrance ticket of this place is not quite expensive. It’s like Rp5.000,- per person. Tips : Better bring some snacks if you want. 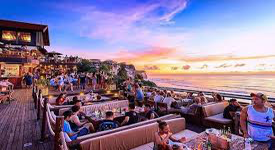 As one of the beautiful things in Bali, also as wonderful as things to do in Batur, there’s one place that people used as a place for hangout around Uluwatu area. The place is indeed less crowded on the morning or day, because the tourist usually just playing around in Uluwatu temple or other beach attractions around. But when the evening comes, the place started getting more and more crowded. People who come here are mainly foreign tourists, especially the surfers. The meals in here are also pretty standard, like pizza or taco. But the view of the vast sea is the one that cannot be surpassed by any restaurant out there. And for the people who see the romantic places around Uluwatu, Jimbaran Bay can be a perfect location for you. Eating seafoods will be different with the nuances that Jimbaran Bay Restaurant gives to you. When the sun finally coming down, all the tables will belit up with the small candles that surround it. 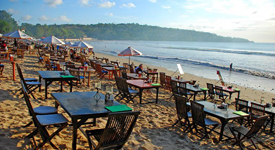 With no walls and no roof, Jimbaran Bay is a very unique sensation of eating sea foods. You only need to pay for parking ticket of Rp5.000,-. The next restaurant, which is actually looks more beautiful than things to do in Abang Bali is Ju-Ma-Na Restaurant. If you want to feel the high quality and luxurious dishes, then this place is maybe the perfect one for you t fill all your expectations. Having modern architecture that dominated with white colour and added with 70m height glass wall, this restaurant really looks so pretty. Not only its architecture that hipnotizing us, but the meals in here are one of the bests. Tips : You can choose so many kinds of food here, starting from Western, Eastern, up to combination of France and Japan. Then in the next spot, the restaurant that can be used as an alternative or the main destination is the El Kabron Beach Club. Hanging around with the ocean view added with some DJ mix and calming infinity pool is the best experience you can get in here. It opens from 11.30 in the day up to 10 pm, so you got a long hours to spend here. You can choose to eat in the restaurant spot or the infinity pool and enjoy the food and the ocean view at the same time. Mostly the dishes in here are Spanish, and they are surprisingly good. Tips : Don’t make to much mess when eating on infinity pool. So what do you think about the 16 romantic things to do in Uluwatu at night above? Where you want to go to spend the night in Uluwatu? Wherever it is, you should choose the locations wisely, because you don’t want to ruin your tour, right? The one thing that everyone should remember when vacationing in Bali and basially everwhere is always be careful when strolling around during the night. It’s adviced to prevent going out during the dangerous hourse like in the midnight til 3 am.